Our Bona PowerScrubber removes the toughest dirt and grime from your hardwood floors to safely and easily protect your investment, leaving you with a beautiful hardwood floor that will last a lifetime. • No need to vacate your home. Furniture peices can be replaced immediately, or we can clean right around them. • No harsh chemicals. Bona's Deep Clean Floor cleaner is GREENGUARD Children & Schools Certifiled. 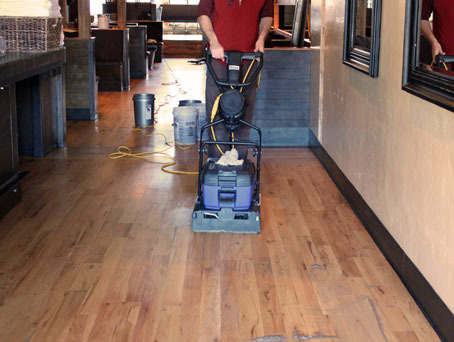 • This process is extremely affordable and keeps your floors looking and performing their best. If you are unable to get your floors as clean as you once could, call us today for a free consultation. Bona's Recoat System is the first and only guaranteed recoat system in the industry. This process safely removes all contaminants from the floor, preparing it for optimal adhesion of new coats of Bona Traffic or Bona Traffic HD finish.